Beware of any offer that is too good to be true. Spot the red flags using the free vehicle history report from the Colorado free license plate lookup. The Colorado DMV is another good source of vehicle information. You may inquire by calling at (303) 205-5600. Visit the Contact Us page for other means of contacting the agency. Recently sold vehicles can be registered in Colorado within 61 days following the purchase. New residents have 90 days to register their vehicles, while owners who have just returned to the country have 45 days. Although paying on time is generally required to avoid late registration fees, exemptions may be granted for applicants with valid reasons, such as when their vehicles were recently recovered from theft. Credentials, like insurance and identification documents, are usually required by the state to register cars. 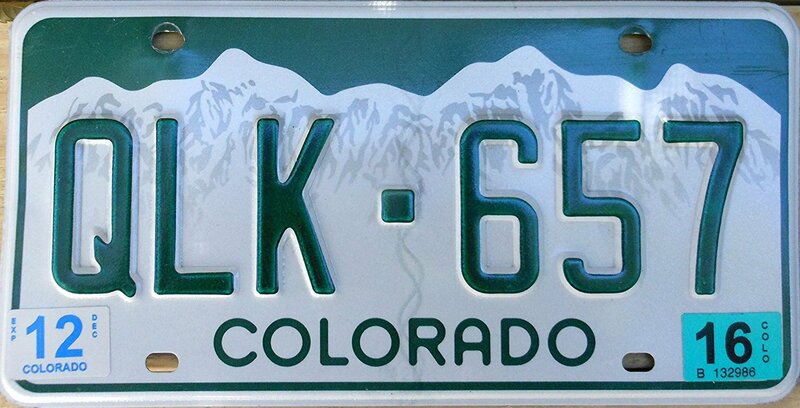 The Colorado Department of Revenue issues the license plates intended for the state. The current plate format for passenger cars has six characters, equally divided into numbers and letters. Two plates are issued for each car, one for the rear and another for the front. To address your concern with lost/stolen plate or permit, you may fill out the affidavit. Be sure to give out correct details to prevent your request from being denied. There are five (5) types of license plate being issued in the state of Colorado. Keep in mind the requirements for each style of plate. Once your request has been approved, you will receive notification about the fees and related information. You must meet the state’s requirements to transfer a license plate between two vehicles that you own. Request a plate transfer as you apply for a title or vehicle registration. Read the FAQs – Registration page for more information about license plate transfer. Title your car by submitting the state’s requirements, such as ownership documents, at a Colorado DMV office. Prepare a budget for the fees. Provide a bill of sale if a car is a recent purchase. As an owner, you need to provide identifying credentials. If there is more than one owner, it should be indicated on the joint tenancy form (see the second page). Documents that prove a car’s specifications, such as papers that reveal actual mileage and weight, may be required as well. If your vehicle is a gas and/or diesel-powered one, it may be needed for emission testing. Check if a car has a lien. If there is a lien, present a mortgage document which confirms its validity. The title might go to the lienholder if the lien is not removed. If there’s no existing lien, it might take a month before you can get your title via mail. Other details about the titling process and requirements in Colorado can be found on the “Titling a Vehicle” page. Buying a used car in Colorado? Don’t make a costly mistake. Run a Free License Plate Lookup for your Colorado-registered vehicle! Run a Free Colorado License Plate Lookup to uncover the full-story of your Colorado-registered vehicle.